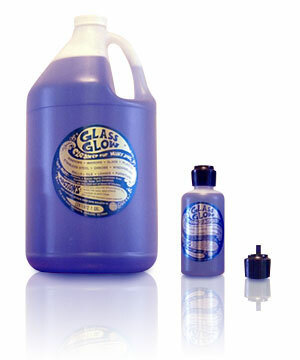 Glass Glow a special highly condensed blue soap, when mixed with water will make one gallon of cleaner. Suggested uses are: glass cleaning - mirror - chrome - stainless steel - Venetian blinds - enamel - automobile windshields - appliances - glazed tile - spectacle lenses - plastic - and for all dusting, cleaning & polishing. 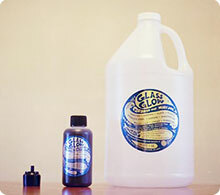 Glass Glow contains no polluting phosphates or chemicals, and won’t harm or pollute our nation’s water’s. Pour concentrate into empty gallon container then add water until gallon is full. Pour back into empty 4 oz, dispenser fill only two thirds of bottle. Close container using lock top dispenser provided and shake bottle for foamy suds. Hold upright, and squeezing bottle apply foamy suds to the surface you wish to clean. Wipe off with a clean towel for a squeaky clean and bright surface.